Amy Adrion talks about her directorial debut, Half the Picture, society's fear of empowering women in film, and how that must be overcome. 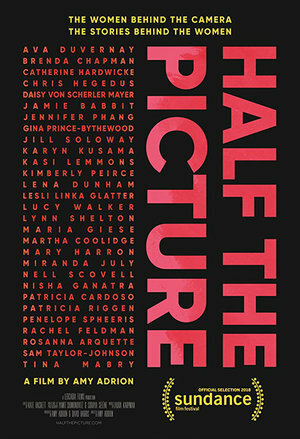 Amy Adrion's feature directorial debut, Half the Picture (2017) gives a voice to her fellow women directors who have struggled against a systemic discrimination that for decades has marginalised and denied women opportunities of creative expression. Featuring interviews with high profile women directors including Ava DuVernay, Jill Soloway, Lena Dunham, Catherine Hardwicke, Lucy Walker and Miranda July, this collection of shared stories of art, lives and careers, of the journey from independent cinema to mainstream films or television, reveals the rift between Hollywood as the 'Dream Factory' and the 'American Dream' itself. Half the Picture is a reminder of progress as a slow struggle, and whilst there is an optimistic glimpse of a future in which the voices of women directors will be valued equally, Adrion's aptly titled documentary reminds us that creative expression has been compromised and impoverished in film history. In conversation with PopMatters ahead of its screening at Sundance London, Adrion discusses growing up with cinema and how she crafts a film out of hope and hustle. She also reflects on cinema's cultural and social influence, fear in response to attempts to recognise our humanity, and the transformative experience of interviewing other women directors. Why filmmaking as a means of expression? Was there an inspirational or defining moment? I am an only child, but my parents are both big old Hollywood movie fans and so I grew up with classic Hollywood movies on the TV all of the time; all day long. It took me a little while to find directing, not that it took me a while to know that was what I wanted to do, but it just seemed like a job normal people didn't do. And I didn't have anyone in my family who actually worked in the business, so I was a film lover for a long time before I gave myself permission to work in film. But yeah, I'm a fan of all different kinds of movies, which are very different tonally from my film. I remember seeing Kevin Smith's Clerks (1994) when I was in high school. I grew up in New Jersey and seeing a film with characters that were like the foul mouthed, funny, profane kids that I hung out with working at a convenience store, to see that a movie could be made from those experiences and with those characters was an ha-ha moment for me of: Wow, you can make a movie about things like that. Your directorial feature debut, how did the expectations compare to the realities of the experience? Well, we started making this film with a passion for the subject and I had a lot of personal experience of working in all kinds of different film roles; I worked at a film festival and I produced on awards shows. But this was a very DIY indie film production and I would say there were not a lot of expectations starting out. I was just hoping that our passion for the subject would enable us to keep reaching out to, and convincing the women we wanted to interview to sit down with us. And to my incredible delight, most of the women we contacted said right away that they wanted to do it. This is a testament to their commitment to talk about this issue of an unfair playing field for women directors that they have been experiencing for a long time. The life the film has had has been a dream. We premiered it at Sundance, played at South by Southwest and we are now going to be part of Sundance London, which is a huge honour, and then we are going to release in theatres in the U.S in June. All of this is just incredible and I am very grateful. But we certainly started out making the film hustling and hoping we could pull it together. One of the shared challenges for documentarian filmmakers is the mass of footage that must be sifted through in order to craft the story. In the edit, did you use the stories of your interviewees to find the film, or going into post-production did you have a clear sense of what it was you wanted to say? From the beginning we knew that our approach was going to be personal stories and intimate settings; filming in people's homes and in their offices. You see the crew behind the scenes working, and having it be the candid personal and intimate stories of these women that you will maybe not have seen elsewhere, was always the mission of the film. You are absolutely right that the challenge of many documentaries, and certainly ours, is you just have so much great material; honestly. Many of these women have had long careers and histories in Hollywood, and they have a lot of great stories to tell. So the balance for us was to try to pull those stories together in a cohesive way to make a tight, engaging and punchy 95-minute long film. We certainly knew topics that we needed to hit, but we could have made literally a ten-hour film with all of the great material and the great stories that these women told us. But we wanted this to stand on its own as a movie and to be something that even if you know nothing about this issue, you can still watch the film and be engaged by these characters, and connect to their stories. So that was a driving force in the edit; to keep it as entertaining as we could, given the subject matter. Art inherently benefits from diversity and so we must contemplate the extent to which the cinematic language has been denied an opportunity for richness and growth. Even if we do reach a point of equality, it does not silence the question of what has been lost, which is a resonating theme of the film. Yeah, I think that's a great point. We hope this film presents these women and the work that they have made under largely very challenging circumstances because they have made incredible films. They have unique voices, and hearing their stories and how tough it has been for them, you realise what is lost for all of us as a culture that so many people are kept out of this system. You keep hearing the same kinds of stories with the same kind of heroes over and over again, and we are becoming fatigued by these. When something comes from a very different perspective or voice, it's fresh and it pops in a way that is really exciting, and there are so many examples of that, whether its filmmakers of colour or women filmmakers. You look at Wonder Woman (2017) or Black Panther (2018), or TV series' like Insecure (2016-), Chewing Gum (2015-), Jane the Virgin (2014-) or Atlanta (2016-). So much of our cultural conversation is about these new ideas from people who have not traditionally been in this system because it's just exciting and it's different. When it's just the same group of people recycling the same ideas, then that's a loss for all of us. One of the interviewees references the idea of the American identity as presented through film. The cinematic art form is a culturally significant force, capable of shaping our impression of other cultures, whilst also allowing us an opportunity to learn more about our own sense of self. Hence, the need for diversity directly relates to ideas of perception and understanding. Many studies have shown that when people can see themselves represented onscreen, their idea of what is possible for themselves can grow. If you are a trans character and you have never seen a movie or TV show that has a character like you, then it's very hard to imagine what is possible for you in the world. We all consume so much media, constantly, and whether it's TV, movies or video games, when it's always certain kinds of characters who are the foregrounded or central ones, and other people are the supporting characters, or have very limited roles or are seen in a very stereotypical way, it effects what we think is possible for ourselves in our own lives. So it's important to have a diversity of experience onscreen, and you see how powerful it is when people finally see that. You go back to Wonder Woman and I was one of many women in the audience crying at the fight scenes, and thinking: Why am I crying? Why am I having this very profound emotional reaction to a superhero movie? But there was just something about the way it was filmed and the angles, the slow motion and the hero shots, and the characters who were grown women in the hero roles that you have literally never seen in your life, ever. And that's powerful! Interviewing Agnieszka Holland I asked her: "Across the decades, the feel of film has changed. For example, the American gangster film of the '40s has a different feel to the gangster film of the '70s onwards. Do you believe this shift is caused by more than technological developments and may reflect a changing aesthetic?" She offered: "I think it is something that is more mystical -- a mystery that is included in the particular film, and which doesn't age." The pursuit of diversity and equality allows us to accentuate the spiritual side of cinema, but would you agree with Holland's idea? Well that's a beautiful way to think of it and it's absolutely true. There is something ineffable about film and the way we can connect to movies, and this is a very exciting time now. There are still a lot of the old media being made, but there's a lot of exciting movement in the different kinds of stories being told by different kinds of people. You can feel that out in the ether, and I think describing it in that way as something spiritual is a beautiful way to think of it. But we are certainly in the moment now where things are changing, and people are speaking out in ways that they have not done before. They are demanding representation and a seat at the table; speaking out about the wrongs that they have experienced in the industry, and with the #MeToo movement in a way that women haven't felt safe or comfortable to do so before. So I definitely think there's something spiritual, a consciousness raising that is happening now that is exciting, and the fact our film is part of that is a real honour. So often films are described as timely, which has become almost an advertorial adjective. Half the Picture not only looks to the struggle of women filmmakers against inequality, but exposes how, in countries celebrated for social freedoms and rights, freedom of expression is infringed. Well this is a very interesting time in politics, certainly in the US and the UK, and around the world. I think people are both excited and scared by changes that are happening, and it's a very powerful backlash. People are feeling disconcerted and uncomfortable in certain ways politically and socially, and that can make them cling to old comfortable dogmas that are really outdated. But there's something about them that makes people feel better, and we are certainly seeing that reaction in so many different fields, whether it's politics or entertainment. People are fighting for their rights and for the full representation of their experience. You look at the internet backlash to a film like the female remake of Ghostbusters (2016), which was the most innocuous, fun movie, yet you would think people's lives were at stake with that backlash. Whether it's something small, all the way up to politics with Donald Trump saying we need to make America great again, and then Brexit and all of that, it's a tumultuous time. And people are dealing with these issues in different ways and there is a lot of progress that I am encouraged by. But I don't think it's surprising at all to see this kind of backlash by people that are scared, who don't know what their place in the world is anymore, and who feel threatened, even though they shouldn't because these movements are about recognising our full humanity, not taking anything away from anyone. It's just wanting our stories to be seen and heard, and valued, and that doesn't disparage anyone else or take anything away from anyone, but we are definitely encountering that fear. Filmmaker Christoph Behl remarked to me: "You are evolving, and after the film, you are not the same person as you were before." Do you perceive there to be a transformative aspect to the filmmaking process? Absolutely, and for this film most certainly. One of the questions I have often been asked at Q&A's is: "Have you learned anything from the women you interviewed? What's the advice you would give?" Basically I say: "Yes, I learned a tremendous amount and the advice that I would give is the film I made." There's so much in the film that's the distillation of the wisdom of all of these women we talked to. But I feel I have learned so much as a filmmaker and a business person trying to have a sustainable career in making movies as a creator. There's so much good advice that these women gave about not taking things personally and understanding that the Hollywood system was not built for us. So when you get rejections and people don't understand your work or connect to it, they don't understand why women's stories matter, then you just need to put your head down and keep on working. Even the women whom I admire the most and who have been incredibly successful have all encountered that, and so that has been very encouraging for me to learn and to understand. I feel like I have grown so much as a filmmaker, making this film, just given the subject and who we have gotten to talk to with in this film. It's an incredible amount of wisdom we have been able to just revel in [laughs], and so I am very grateful to have experienced the process of making this film. The European Premiere of Half the Picture takes place at Sundance London on Friday 1 June at 6:45pm, followed by a second screening on Sunday 3 June at 5:40pm. For further information and tickets click here.